BladeRunners specializes in Area Designs and Master Plans. An Area Design is one that is focused on a specific area of your yard. A Master Plan is one that is focused on two or more areas of your yard and/or a full landscape. Throughout the design process BladeRunners listens to our customers to create a landscape that best fits their needs. To accomplish this we schedule a visit to discuss your likes, dislikes, ideas and concerns for your yard. We focus on environmental factors such as soil type, drainage, availability of water, sunlight and wind exposure. This information is used to select proper plants for the location. Following a personalized visit to your site, we create a specific plan using actual dimensions from your location. The designs are drawn to scale using a computerized landscape drawing program, making them easy to view and understand. We then walk you through the plan explaining the plants and layout. In addition, 3D renderings and videos can be done so that you can experience your landscape prior to installation. The cost of each plan is credited toward the cost of the installation should you contract with BladeRunners for the installation. In addition, each plan is accompanied by an itemized estimate of the exact cost for materials, installation and labor. This allows for you to see specific costs without surprises at the start or completion of the job. The plan also includes a detailed booklet of plant care, with corresponding photos and descriptions. 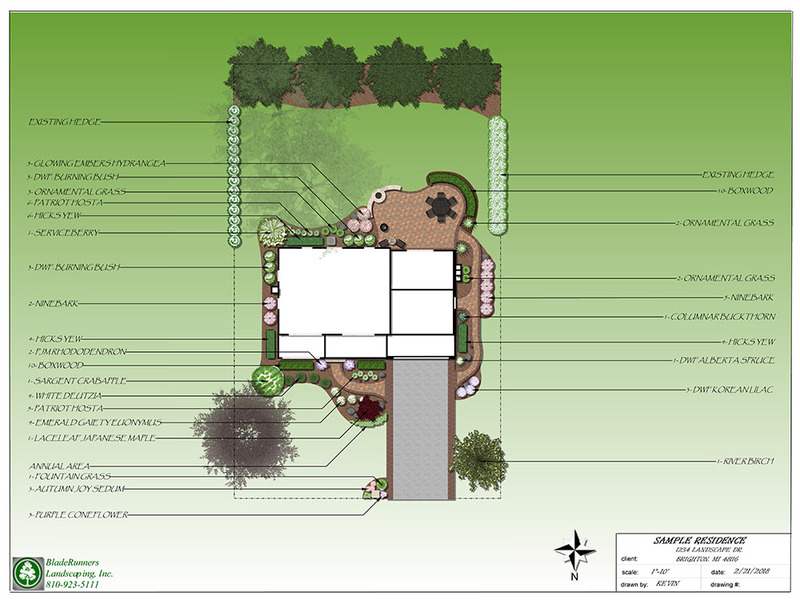 This helps you visualize your landscape plan, along with aiding in future recognition and care of your plants.